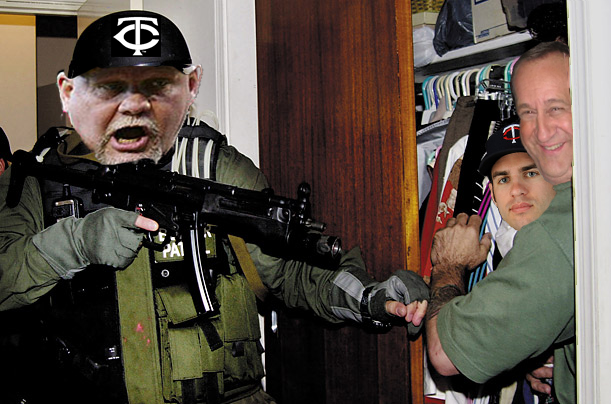 Gardy Raids Florida Home, Seizes Joe ‘Elian’ Mauer | That's Twins Baseball. A Minnesota Twins Blog. Listen here you sonofabitch, you're coming with me. DEL BOCA VISTA — It had been over month since Joe Mauer was in the Twins lineup and fans were growing impatient. They wanted to see their hometown hero play, even if it was for a team that may win 50 games this season. The Twins front office was also growing impatient and a little worried. They knowingly sent Joe Mauer down to Florida for some rehab, however they didn’t think he would be gone this long. Originally planning for Mauer to be gone about a week or two, there was a heightened level of concern after a month had passed. That’s when Ron Gardenhire decided to take things into his own hands. Gardy had grown up an army brat and spent long afternoons watching the special forces train. Gardy never forgot what he learned during his childhood and he put it to good use. Equipped with a machine gun and a funny helmet, he raided the Rosen Compound in the middle of night and seized Joe ‘Elian’ Mauer from the clutches of local sports anchor (and participant in a longtime bit that he is Joe’s father), Mark Rosen. Joe plans on returning to the Twins lineup after debriefing with General Soreness.